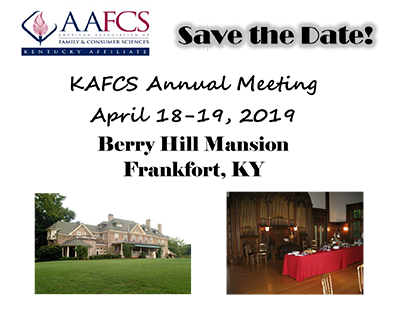 The Kentucky Association of Family & Consumer Sciences (KAFCS)is the Kentucky affiliate of the American Association of Family and Consumer Sciences (AAFCS). AAFCS is the only nationally recognized organization that brings together a variety of professionals to address critical topics challenging society and to promote research-based life skills education. Since its organization in1909, AAFCS has brought together K-12 teachers, university educators, Cooperative Extension agents, dietitians and other FCS professionals collaborate to improve the quality of individual and family life. We educate and influence generations of American consumers in our classrooms, our organizations, and our communities.